Create Denodo data source connections using a group account, departmental account, or other shared account, not a personal account. For more about group accounts, see Request IU computing accounts for groups or departments. In Denodo, create a new LDAP data source. Name: Choose a unique name, preferably beginning with ldap and ending with the account name. Password: Enter the ADS account password. 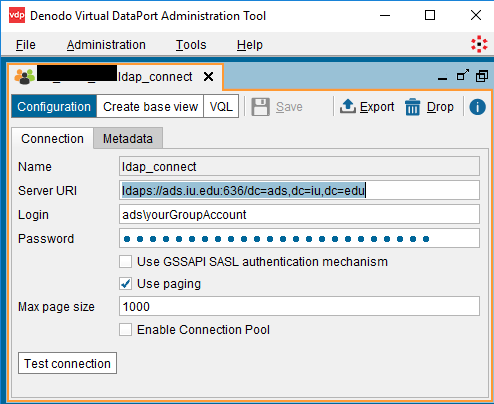 Once you've set up your connection, you can construct a query using the Denodo LDAP browser, or use a LDAP filter or query. This is document ankz in the Knowledge Base. Last modified on 2019-01-18 06:02:15.